The famous alpine resort of Morzine, French Alps, is located at the heart of perhaps the largest ski and snowboard area in the world, the Portes du Soleil. This extensive and popular winter holiday destination spans the French – Swiss border and encompasses 12 fantastically linked ski resorts. 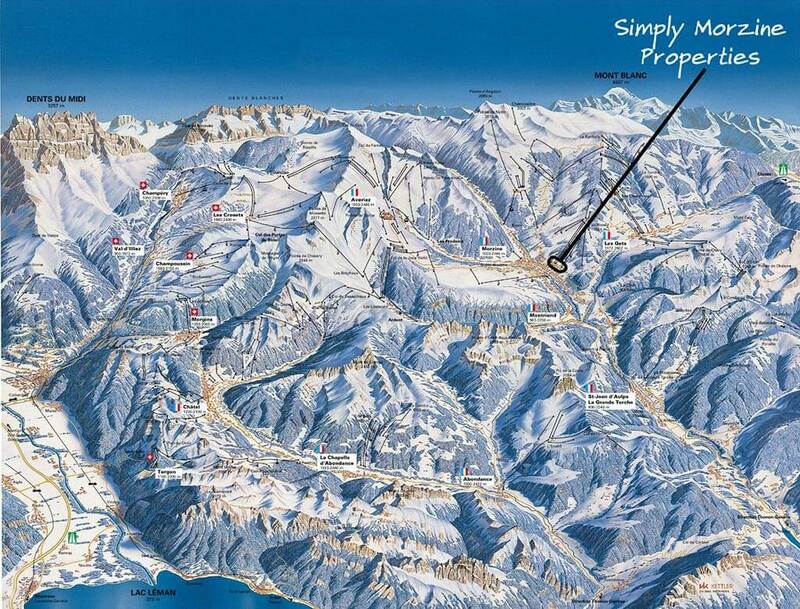 Each offers a vast variety of pistes for all abilities of skiers and snowboarders. All Simply Morzine chalets, apartments and our Morzine hotel are ideally situated in the centre of the immense Portes du Soleil. Our Morzine accommodation provides the perfect base to explore the wonders this famous ski area has to offer. Morzine is a traditional and authentic French farming and slate-mining town, the largest in the Portes du Soleil, with fantastic access to the entire ski and snowboard area. There are two main ski lifts in Morzine; the Pleney and Super Morzine cable cars. A free shuttle ‘petit train’ service runs between them daily. The new Pleney telecabine gives access to the Morzine-Les Gets ski area; home to most ski and snowboard lessons due to its multitude of beginner-friendly green and blue runs and magic carpet learning area. Super Morzine gives quick access to the slopes and the ski link to Avoriaz via the Zore and Proclou chairlifts. Our neighbouring, purpose-built, ‘sister’ resort perches on the cliffs above Morzine at an altitude of 1800 metres. Avoriaz is host to fantastic skiing and snowboarding, with great snow conditions and providing the link to Chatel and the Swiss resorts of the Portes du Soleil. Avoriaz can be accessed via the Super Morzine telecabine or the Prodains Express telepherique, which can be reached using the navette (bus) “A” from Morzine. Les Gets is the next town along from Morzine and their shared ski area is perfect for all abilities, especially beginners and intermediates thanks to the rolling tree-lined terrain. From the bottom of the main Chavannes chairlift, the local ‘petit train’ provides shuttles to and from Mont Chery, a beautiful and quiet section of the Portes du Soleil. The local free navette bus service provides transport to and from Morzine, through Montriond, past the spectacular Lake Montriond to the Ardent telecabine. There’s a free car park at Ardent. The telecabine provides access to the Lindarets bowl, the iconic goat village and on to Avoriaz or Chatel. A charming Portes du Soleil village with a large ski area, partially overlooking Lake Geneva. Chatel is now easily accessible from Morzine through Lindarets, Plain Dranse and Linga without having to catch a bus. One of only two isolated resorts in the Portes du Soleil. A short bus journey from Morzine gives access to this extremely tranquil ski area. Perfect for avoiding the busy lift queues in peak weeks, or to find gloriously untouched powder. Les Crosets is the first Swiss area found after Avoriaz. It can be accessed via Mossettes or the infamous Swiss wall (Chavanette), a notoriously steep and difficult mogel field. Champoussin is very quiet and peaceful, with fantastic views in all directions. A small and idyllic Swiss village that is roughly the midway point of the Portes du Soleil circuit. A free and short shuttle bus runs across Morgins to provide access to Chatel. These smaller resorts lie on the outskirts of the Portes du Soleil. Champery and Torgon can be skied to through Switzerland. La Chapelle d’Abondance & Abondance are French resorts the other side of Chatel and can be accessed via regular shuttle bus services. The more adventurous riders may wish to venture this far to explore the full Portes du Soleil area. The extraordinary Portes du Soleil ski and snowboard area is host to a plethora of beautiful, charming alpine villages. The truly wide range of skiing and snowboarding is waiting to be explored from your Simply Morzine accommodation.